Plastic RV holding tanks are great replacement RV tanks that have a variety of usages and applications. These all purpose RV holding tanks are manufactured from Food & Drug Administration approved polyethylene resin and come with a premolded outlet. We also install any additional fittings per your specifications. 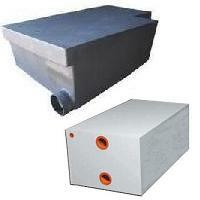 RV Holding Tank walls vary in thickness from 1/4" to 3/8". Plastic-Mart.com is proud to be your RV holding tank supplier. These tanks are a compatible solution to replace your older ABS plastic tanks. We offer 100's of different sized replacement holding tanks for your RV, Pop-up Camper, Motorhome or Travel Trailer.